One simple way schools can observe Earth Day is to take learning outside the classroom and have students interact with their environment. Nature walks are a fun and easy way to bring your students outdoors, whether it’s on the school grounds or at a park or another local place of interest. Doing a nature walk is not only about celebrating Earth Day. It’s also an opportunity for learning experiences in a variety of subjects such as science, geography, math, and art. Each nature walk offers something different for students to explore – even if you walk the same trails from one day to the next. If you live in a colder climate, the changing seasons can be another great way to observe plants and animals as the weather shifts. Nature walks aren’t only a fun activity, there are also significant benefits to bringing your students outdoors. According to an article by BBC News, outdoor learning boosts children’s development. And a growing number of researchers and educators are also sharing the benefits of outdoor learning. Remember, outdoor learning doesn’t have to be a dull and laborious trudge through the bush. In this article, we’ll take look at some activities that will ensure nature walks are an engaging and enriching learning experience for students of all ages. Oftentimes in a scavenger hunt, objects are hidden throughout the search area and the children then search out these items. However, instead of looking for pre-hidden objects, students can look for plants, animals, and objects found in nature. For example, this ‘Nature Scavenger Hunt Grid’ sets out some basic things to look for such as water, a spider web, and bark. You could also create your own grid or checklist suited to a particular grade level or topic. Not only could students look around their surroundings for artistic inspiration, they could collect objects to be included in a piece of art. There are a lot of approaches to this and it depends on what is available in your area. You could look for ochres that could be used to make paints, collect pieces of bark, dried leaves or flowers to make a sculpture, or even collect sticks to build something with, such as a birdhouse. Another option is to source natural dyes for some tie-dying activities (make sure you do your research on plants in your area so you’re sure what you collect is safe to use). Local ponds, swamps, and dams are teeming with microorganisms and bugs. Why not take some dip nets and magnifying glasses with you on your nature walk? Stop at these ponds and allow the students some time to do some dip netting. Not only will they be able to see what sort of critters live in the ponds and study them, they could collect water samples and take them back to the lab for further analysis under a microscope. Older students may want to do some water tests on a local waterway while on their walk. For example, they could test pH, conductivity or dissolved oxygen. This could be done in the field, or samples could be taken back to the lab. It may also be interesting to investigate the factors that are contributing to the different readings in each location. One of the best things to do on a nature walk is to simply observe what nature has to offer. But with the growing prevalence of devices and interactive science apps, there’s a lot more you can do. For example, with an app such as iNaturalist, students can record, catalog and share what they have found. The app also facilitates connection with thousands of scientists to help users identify the species they have observed. With other apps such as Trees Pro HD and Leafsnap, students can also identify the plant species in your area. Students can construct detailed maps as they explore. During their walk, they can note the tracks, rivers, landmarks, or other unique natural features. These maps could even be given to other students in different grade levels to facilitate exploration activities, such as a treasure hunt. You can vary this activity’s difficulty level by changing what students are required to map. For example, older kids could include topographical information, scales, and grid lines, to name a few. Another great activity is to have students time their walk, and measure the distances traveled with a trundle wheel. Students could simply calculate their average speed over their journey, or they could do some distance-time graphs when they return to class. Alternatively, have students measure trees in different ways to get familiar with a tree’s scale and structure. These activities will add a new element to nature walks! 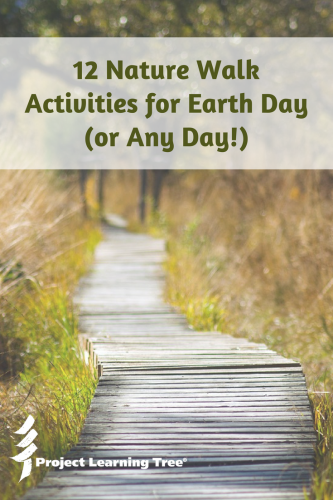 If you’re exploring environmental issues and sustainability in your classroom, this is often a go-to activity for Earth Day. In line with these themes, students could raise money for, purchase, and plant trees in their local environment. This will also lay the foundation for subsequent nature walks as they go back to tend to the trees and check their progress. You may also like to involve some other community groups. If you’re able to extend your time outdoors, having a snack or meal is a great way to take a break while you’re exploring the outdoors. Use the opportunity to enjoy some bird watching or talk with your students about what they have seen and learned. Or if they have taken photos, take some time to share and discuss them as a class. This one may be better for the older students and depends on what equipment you have available. Nonetheless, here are some suggestions: take wind speed or sunlight measurements in different areas and relate them to the species of vegetation and animals that populate that area. Or, take regular walks to collect data from equipment left in the field such as rain gauges. Get students to gather a collection of seeds from a wooded area. They can drag an old blanket or fuzzy cloth behind them on the ground. They can place a large, old, wool sock over hands or shoes to see what they can pick up. Or they can wear bracelets made of masking tape (sticky side out), to hold the seeds they find. Have children examine their seed collections and invent a system for sorting or classifying them. Explain that plants have developed many different methods of seed dispersal, to ensure the success of their species. In the spirit of environmental management and sustainability, it’s a great idea to take some big garbage bags along with you on your walk and pick up some trash if you see it lying around. This can be a segue into science lessons or projects directly related to these themes. It can also motivate students to research or design alternatives to manage mankind’s waste. Do you have any other suggestions for nature walk activities? We’d love to hear them! Share them in the comments below.